Have you been in email marketing for more than a year? Do you write and send your own emails? If you answered yes to all of the above questions, it’s quite likely you’ve sent an “oopsie” email to your list. Whether you were moving too fast, multi-tasking, didn’t have a sound QA process in place – whatever – you’ve probably sent an email that included an error. After all, we are human (see question #3). Mistakes happen. If your inbox looks anything like mine has over the past few weeks, it’s been flooded with emails announcing deals for pre-Black Friday, Black Friday, pre-Cyber Monday, Cyber Monday, day-after Cyber Monday, and so on. I don’t think the totals have been compiled quite yet, but suffice to say that over the past few weeks, there’s been a boatload of email. Considering the sheer volume of emails, it’s not surprising that marketers made a few mistakes. But, as we all know, it’s less about the mistake and more about how you respond to the error. Depending on the type of mistake (bad link, wrong email, sensitive information, etc.) and the reach of the message (small segment vs. entire list), the apology email’s message – and who it gets sent to – can vary greatly. Unless the mistake involved sharing sensitive information or was potentially harmful, I’m a big believer in sending an apology email that has a human – and humorous – side. 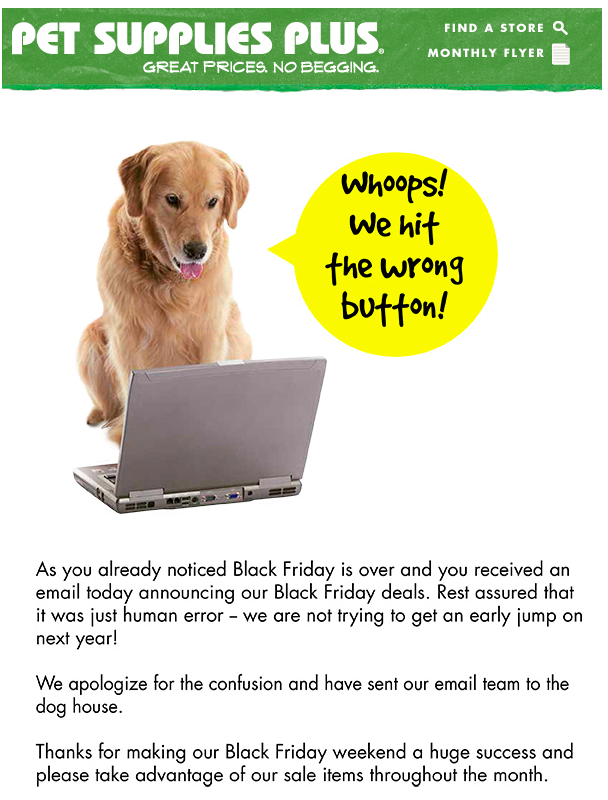 That’s one of the many reasons I love this next email from Pet Supplies Plus. 1. First, and most importantly, they owned it. The subject line says it all: “Whoops! We hit the wrong button!” They didn’t beat around the bush. They didn’t mince words. They told it as it was…in the subject line. 2. They included a picture of a dog – typing on a computer. As we all know, if you want to diffuse a potentially bad situation, animal pictures almost always work. It just so happens this picture is very much on brand with Pet Supplies Plus. Double win! 3. They reinforced the apology with the exact same language used in the subject line. It never hurts to say you’re sorry twice. 4. They concisely explained what happened (they sent the same email twice) and added a touch of humor (“we are not trying to get an early jump on next year!”). As I’ve said before, using humor in your email shows that you’re human. 5. They apologized again (“we apologize for the confusion”), added some humor, AND tied it all back to the dog(house)! All in all, I would say this was a perfectly executed apology email. Well done, Pet Supplies Plus! One thing I noticed that was lacking from this apology email was a coupon or some other discount offered for making a mistake. I see this all the time in oopsie emails – “We messed up; therefore we are going to say we’re sorry with this coupon.” While that approach can work at times, it depends on the situation. In this case, a “we’re sorry coupon” would have been overkill. After all, this mistake was quite minor in the grand scheme of things. On a side note, I think it would have been funny if they had added, “No animals were hurt in the sending of this incorrect email.” Funny, right? What is the best apology email you’ve ever seen? What do your apology emails look like? Please share in the comments below! 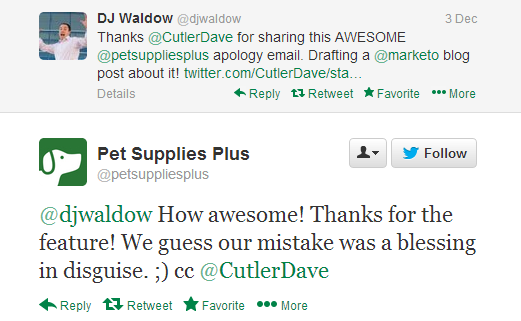 Hat tip to Dave Cutler for sharing this Pet Supplies Plus apology email with me.